In autumn of 2015 technical specialists of FIRE GROUP developed and produced the first vehicle of foam extinguishing APT-6,0-70 (4320) by the order of the global oil company ROSNEFT. The vehicles of foam extinguishing are examples of modern fire-fighting techniques’ generation, highly demanded by oil and petro-chemical enterprises. The vehicle of foam extinguishing APT-6,0-70 (4320) provides delivery of large volume of foam of needed expansion ratio through handle and stationary equipment, using its own tank, fire hydrants, natural or artificial reservoirs. If the tank is filled with water, the vehicle can be used as a fire fighting tanker. Although in contrast with standard fire fighting tanker if both water and foam tanks are filled with water, one can successfully extinguish fires in tanks with oil products. Expanding the model range of special purpose fire fighting vehicles, company PRIORITET turned out new pumping station PNS-110 on KAMAZ chassis. The fire fighting pumped station is used for large fire extinguishing when delivery of large volume of water to the long distances is demanded. PNS-110 can be operated together with hose containers and fire fighting tankers especially in the case of wild fire or fires at the oil refinery plants. A big step forward for our company is developing of two new models of heavy and medium class airfield vehicles. AA-12.0-60 (63501) is one of the most in-demand airfield vehicles on the market. In spite of large volume of transporting fire extinguishing means one of the key features of the vehicle is opportunity to use it even in hard climate conditions: warmth-keeping and heated water and foam tanks. AA-10.0-100 (65222) is the best offer among medium class airfield vehicles due to its speed performance and capacity of water and foam tanks. The vehicle is equipped with unremovable runway foam carpet spreader which meets the vehicle dimensions. 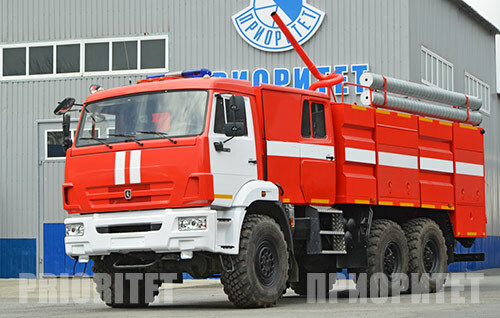 The new special–purpose firefighting vehicle of combined fire extinguishing AKT -7/1000-40/20 on chassis KAMAZ – 43118 was produced in October, 2014. This special – purpose firefighting vehicle is equipped with powder module, which has 1000 kg capacity of firefighting powder. This module may be used to extinguish the fire by rater, foam and powder. The simultaneous operation both in water – foam and powder modes is available. The foam and water tankers are made of stainless steel. The powder and water supply from tanks is provided with the help of the process of their extrusion by compressed air. The operating of powder and foam supply valve through the fire monitors is remote and is provided with the help of remote control placed near the fire monitor. 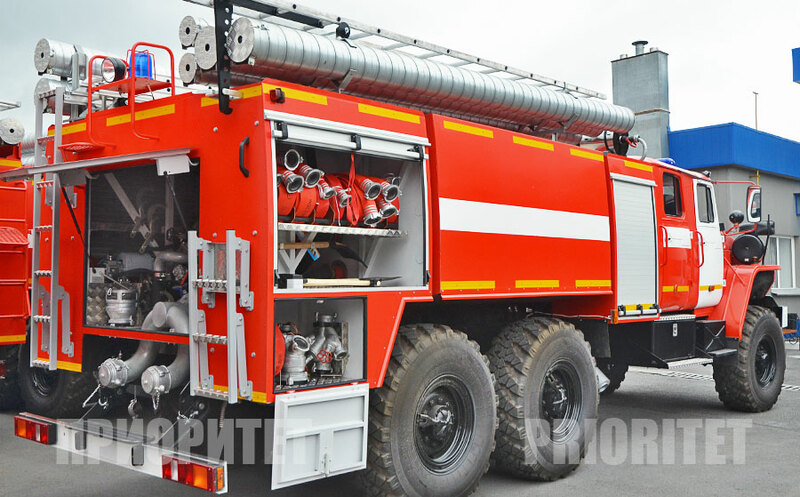 AKT -7/1000-40/20 is equipped with spacious compartments for fire fighting equipment. We are glad to introduce you the production release of new firefighting pumped – tanker AZ–5,0–50 on chassis Ural–4320-79. Newly-designed product is the figure of the latest technical solution: the vehicle is equipped with pump unit LSA-3000 which may be used both as standard fire pump and effective compressed foam firefighting system. economy of foam agent by usage of the more concentrated (1%) foam agents and exacting electronic inspection of the foam agent consumption.